Home > Aviation Batteries > Yaesu & Vertex Standard > NC-72BA : AC-DC Battery Charger/Power Supply for Yaesu/Vertex. Replaces NC-72, NC-72B, etc. IN STOCK ! 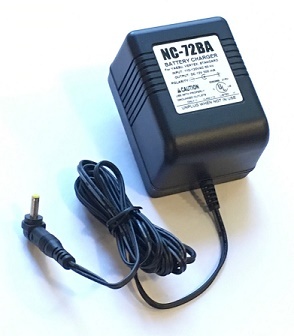 The NC-72BA is an AC-DC Power Supply/Battery Charger for Yaesu & Vertex. Replaces original NC-72, NC-72B, NC-72C, PA-48B etc. Plugs into 110-120VAC outlet. Output is 12VDC @ 500mA, with custom-sized Yaesu-Vertex connector at other end. Plugs into Radio, or can be plugged into Charger base. Designed for Radios such as FT1D, FT2D, FT1DR, FT2DR, VX-8, VX-8DR, VX-5R, VX-6R, VX-7R, VX-8R, FT-817, FT-60R, FT-270R, FT-277, VX-150, Aviator Pro II, Aviator Pro III, Aviator Pro IV, Aviator Pro V, VX-110, VX-120, VX-127, VX-130, VX-150, VX-160, VX-170, VX-177, VX-180, VX-210A, VX-250, VX-270, VX-277, VX-400, VX-410, VX-420, VX-800, VXA-150 Pro V, VXA-210, VXA-220; also plugs into CD-15, CD-15A, CD-41 charger bases. EXCLUSIVE value-priced premium product from BATTERIES AMERICA. IMPORTANT NOTE: This Power Supply weighs approximately 1 pound, and ground shipping costs to residential can actually exceed $10.00; Therefore, an additional $2.00 is added for S&H.